The key to proper pool chemistry and balanced water is your pH. It should read between 7.2 and 7.6. When your pH drops below 7.2, just add pH Increaser to counteract the problem. 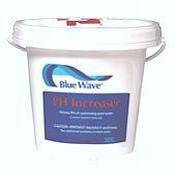 This will raise pH in your pool or spa. The active ingredient in this granular product is Sodium Carbonate. "soda ash". Dosage rates vary based upon pool volume and current pH level. Normal use is 1 lb. per 10,000 gallons.